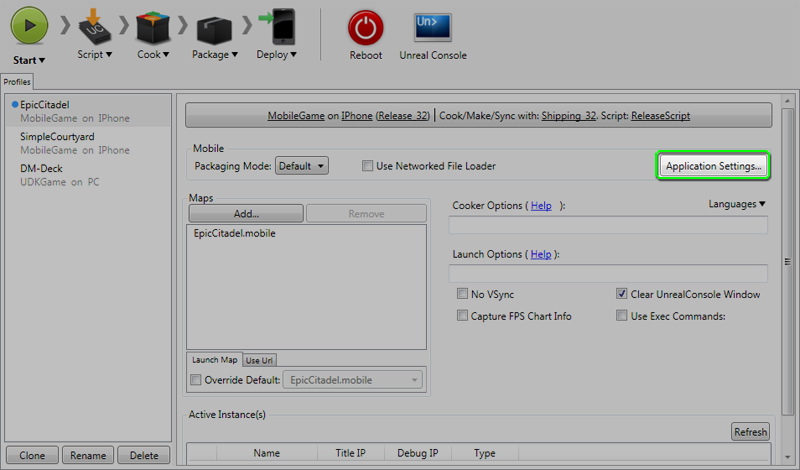 The iPhonePackager tool is used to package UE3 applications to run on iOS hardware devices. It also handles configuration and installation of related files such as signing certificates and mobile provisions, as well as deployment to connected devices. [ switches ] - An optional space-separated list of switches that control various aspects of the packaging process (each starts with -). packageapp - Collects and transfers files to package to a remote Mac and generates an application directory, but it does not create an IPA or copy the files back to the PC. This mode requires RPCUtility to be installed on the remote Mac, and is designed to be used with XCode for further debugging on the Mac. repackageipa - Collects files to package into an IPA, but does so locally on the PC. This mode requires a stub file to have been previously generated by packageipa. Can be used in conjunction with -sign to code sign the application. packageipa - Collects and transfers files to package to a remote Mac and generates an IPA, which is transferred back. Requires RPCUtility to be installed on the remote Mac. Can be used in conjunction with -createstub to make a stub for later use with repackageipa (packageipa -createstub is the default mode used by compiling UE3.sln for iPhone targets). install - Deploys a previously created IPA to all connected iOS devices on the local machine. Requires iTunes to be installed. The IPA name is either automatically chosen based on <GameName> and <Configuration>, or it uses an explicit filename if passed on the command line as an extra argument (e.g., "iPhonePackager deploy UDKGame Release C:\foo.ipa" will install C:\foo.ipa instead of <installpath>\Binaries\IPhone\Release-iphoneos\UDKGame\UDKGame.ipa). gui - Brings up the configuration wizard / tools list. See Unreal iOS Configuration Wizard. The configuration wizard offers a friendly way to provide these files, or generate a CSR request to get the provision and certificate from Apple. Used to specify that the packaged IPA will be used with network file loading (incompatible with -distribution). Controls how much effort is put into compressing is used when creating the IPA. During development, -compress=none results in the fastest iteration times, saving compression time on the PC and decompression time on the iOS device. Use -compress=best when preparing for App Store submission to get a better feel for submission size. Used when doing builds for distribution to the App store. Controls the selection of signing identitiy, and the name of the output IPA (Distro_GameName.ipa). Perform code signing during packaging on PC. When doing packaging on a remote Mac, code signing is always performed. 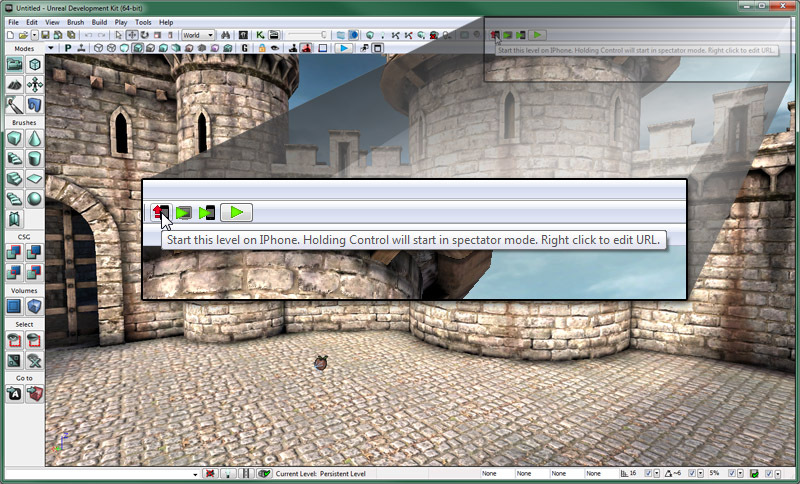 Controls whether or not the executable will be stripped of symbols. Only heeded when doing a remote packaging operation on a Mac. Controls whether a remote packaging operation on a Mac will package all content, or just essential content, and the name of the returned .ipa on the PC (.ipa or .stub). This option is incompatible with -distribution. 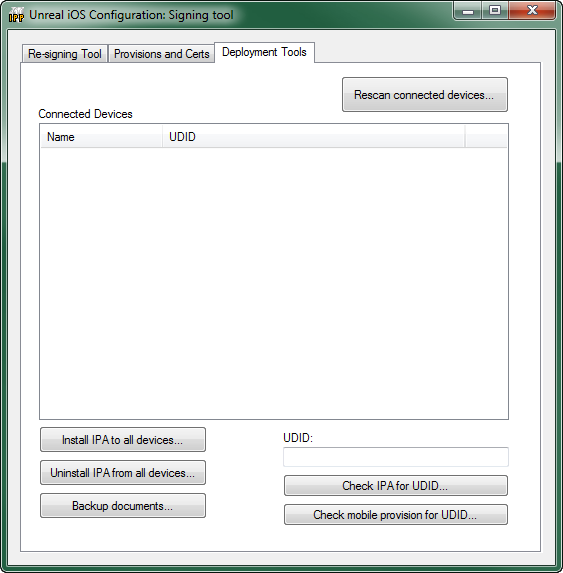 The Unreal iOS Configuration wizard is the graphical interface for the iPhonePackager tool. It provides access to all of the functionality of the iPhonePackager, such as packaging your application, signing your application with your apple developer credentials, and deploying the package to your iOS device, in an intuitive visual interface. 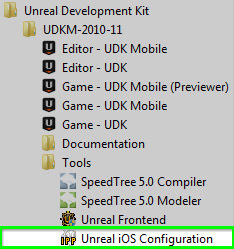 The Unreal iOS Configuration wizard can be launched from in the editor, the start menu or from Unreal Frontend. It will auto launch the first time you go to deploy to your iOS device, after that you will need to manually launch it if you want to change the data in it. 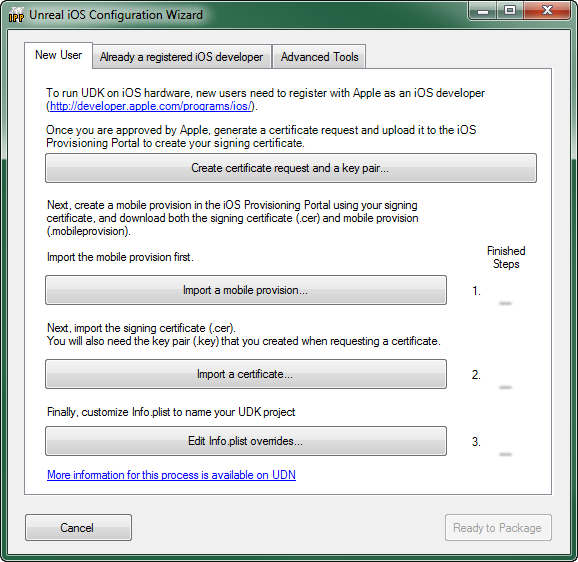 If the steps to configure iOS provisioning yet, the Unreal iOS Configuration wizard will be launched when you click the Start this Level on iPhone button in the toolbar. A few console windows will appear first and then the configuration wizard will appear. The Unreal iOS Configuration wizard can be launched at any time for the shortcut located in the Start menu in Windows. It can be found under Unreal Development Kit > [Your UDK Version] > Tools. Clicking this shortcut will open the configuration tool allowing you to initially configure your iOS provisioning or to update it should it be necessary during development. The Unreal iOS Configuration wizard can be launched directly from within the Unreal Frontend application by clicking the button. Clicking this button will open the configuration tool allowing you to initially configure your iOS provisioning or to update it should it be necessary during development. 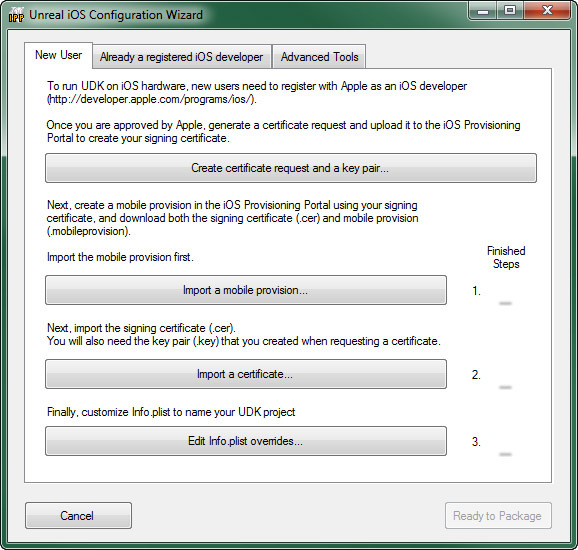 The Unreal iOS Configuration Wizard interface consists of a collection of tabs, each containing specialized functionality for different parts of the provisioning and deployment process. Closes the configuration wizard, without continuing the packaging process if it was in progress. Closes the configuration wizard and continues the packaging process if it was in progress. The tabs of the configuration wizard are detailed below. The New User tab contains tools for developers who have not developed iOS applications previously. Opens the Generate Certificate Request Window. Imports a provisioning profile downloaded from Apple's Developer website. Imports a development certificate and key pair downloaded from Apple's Developer website. Opens the Edit Info.plist Window. The Already a Registered iOS Developer tab contains tools for developers who have previously developed iOS applications, either using Unreal or through other methods, and already have a development certificate and provisioning profile. Imports a development certificate and key pair previously downloaded from Apple's Developer website or a .p12 file exported from Keychain Access. The Advanced Tools tab contains tools for signing, installing, and deploying IPAs. 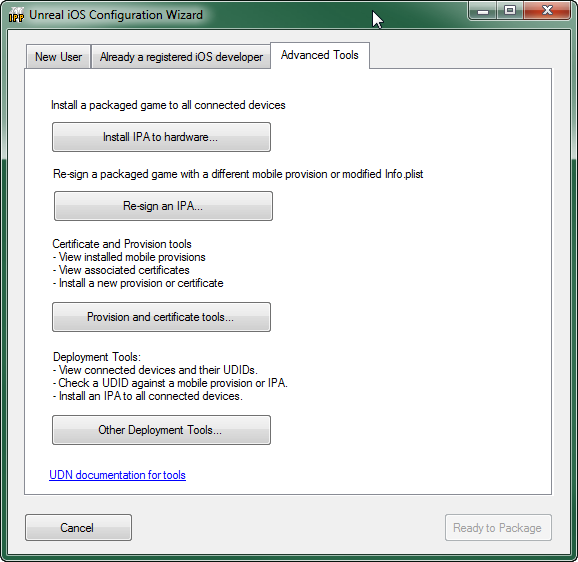 Installs a packaged game (IPA) to all connected iOS devices. Opens the Re-signing Tool Tab of the Signing Tool. Opens the Provisions and Certs Tab of the Signing Tool. Opens the Deployment Tools Tab of the Signing Tool. The Generate Certificate Request window generates a key pair for signing your iOS applications and a certificate request that is used to generate a certificate on Apple's Developer website. Email Address The email address associated with your Apple iOS Developer account. Common Name The name to be associated with the certificate. Generates a new key pair file. Imports an existing key pair file. Generates the certificate request file (.csr) to be uploaded to Apple's Developer site to create the development certificate. The Customize Info.plist window is used to edit the contents of the Info.plist file. Opens a file explorer showing the Info.plist file so it can be opened and manually edited. Saves the information in the above fields to the Info.plist file. The signing tool is a collection of tabs, each with specialized functionality. These tabs and their functions are explained below. 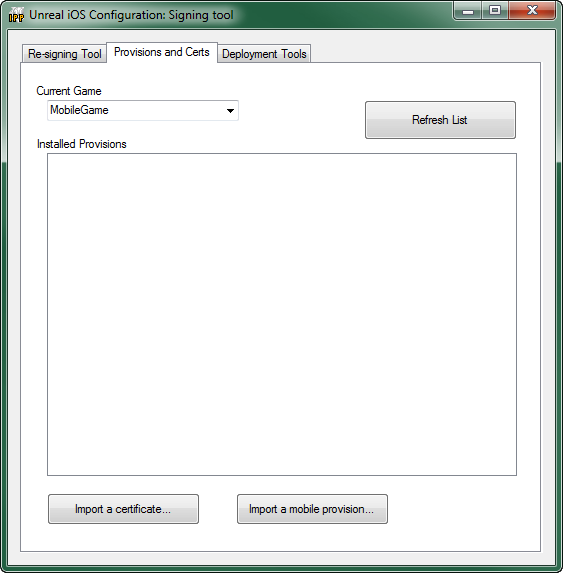 The Re-signing Tool tab provides the ability to quickly and easily modify the provisioning profile, certificate, or Info.plist of a particular packaged game (IPA file). Set the input packaged game file to re-sign. Use existing embedded.mobileprovision - Does not modify the provision profile associated with the IPA. Specify mobile provision file - Set the provision profile to replace the current provisioning profile with. Search for a matching certificate - Search for an installed certificate that matches the certificate the IPA has been signed with and use that for re-signing the IPA. Specify an explicit certificate - Set the certificate to replace the current certificate with. Leave Info.plist unchanged - Performs no modifications to the current Info.plist of the IPA. Common Modifications - Allows the most common aspects of the Info.plist to be replaced. 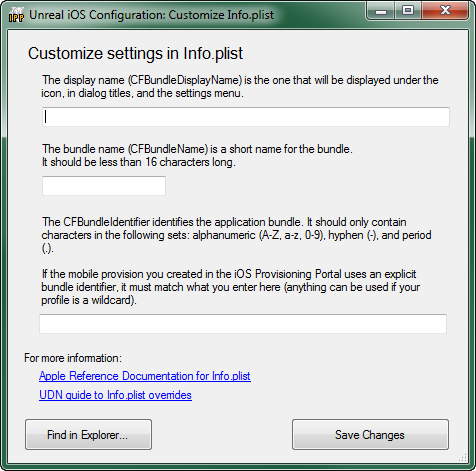 CFBundleDisplayName - Sets the string to use to replace the current bundle display name. Full Editing - Allows the Info.plist of the IPA to be exported, manually edited, and re-imported. Exports the current Info.plist of the IPA to a file so it can be edited manually. Compress Modified files? - If checked, the modified files will be compressed. Creates the re-signed IPA using the input IPA and performing the specified adjustments. The Provisions and Certs tab displays the provisioning profiles and certificates currently installed and imports additional provisioning profiles and certificates. Refreshes the Installed Provisions list. New installed provisions and certificates are not displayed until the list is refreshed. Imports and installs a new certificate. Imports and installs a new provisioning profile. Rescans for connected iOS devices and repopulates the Connected Devfices list. Installs an IPA to all connected devices. If the application is already running on the device, it will be terminated before installation completes. However, installation will proceed faster if the device is idle (no 3D applications running, etc...). Uninstalls an IPA from all connected devices. [DeviceName] is the name of the connected device being backed up (e.g., 'Michael's iPhone'). Checks to see if the device ID entered is associated with an IPA. Checks to see if the device ID entered is associated with a mobile provision. Navigate to the IPA that you used on device. For example, if you cooked Release UDKGame, the IPA would be: \Binaries\IPhone\Release-iphoneos\UDKGame\UDKGame.ipa. You can then open up any profiling files via the associated application, such as GameplayProfiler.exe.